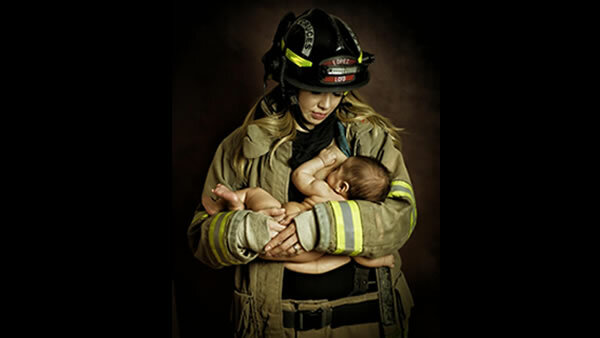 LAS CRUCES, New Mexico -- A New Mexico firefighter is in hot water over a photograph of his wife that shows her breastfeeding their newborn in his firefighting uniform. The photo went viral last month, and now, it's turned into a breastfeeding battle. "I was mad. I was mad for the mom and I'm mad for the husband that she has that's supporting her in this," said Tara Ruby, the photographer who took the controversial photo. A source close to the investigation says the firefighter faces discipline up to unpaid leave. "It just shows that they're not supportive. Absolutely not supportive," Ruby said. The photo is part of a "mothers in uniform" photo series. "There's no different than, say, somebody dressing up in a clown suit and doing it. It's the exact same thing, it's just that there's a story behind this photo and that it's a powerful one and maybe one that no everybody's ready to hear," Ruby said. A spokesperson for the Las Cruces Fire Department said that because this is a personnel matter, they can't talk about it. Ruby feels like this is a step backwards in the fight to normalize breastfeeding. "We are pushing that boundary between a male dominated role and where we're bringing in femininity into that position," Ruby said. Ruby is no stranger to controversy. This fall, her photo of Fort Bliss soldiers nursing in camo took the internet by storm. "And if we want to be a firefighter or a police officer or even active duty military, we can do that and we still have the rights as a mom to breastfeed our child," Ruby said. Ruby says this will not stop her from photographing mothers responding to their own motherly duty. Las Cruces city spokesman Udell Virgil told the Las Cruces Sun-News that the fire department's policy on uniforms does not specifically mention spouses. It's also not clear whether spouses can actually wear uniforms. Udell also says Las Cruces has no policy regarding breastfeeding.